About two weeks or so ago – just going about in my busy-ness – out the back I heard a faint ‘trill’ sound from a bird that I did not know – as I continued on with my busy-ness God put it on my heart to change my phone ring to ‘trill’ – I did – I knew God was saying something prophetic to me & Today He confirmed to me that I am hearing Him well – so wonderfully mysterious is my God! 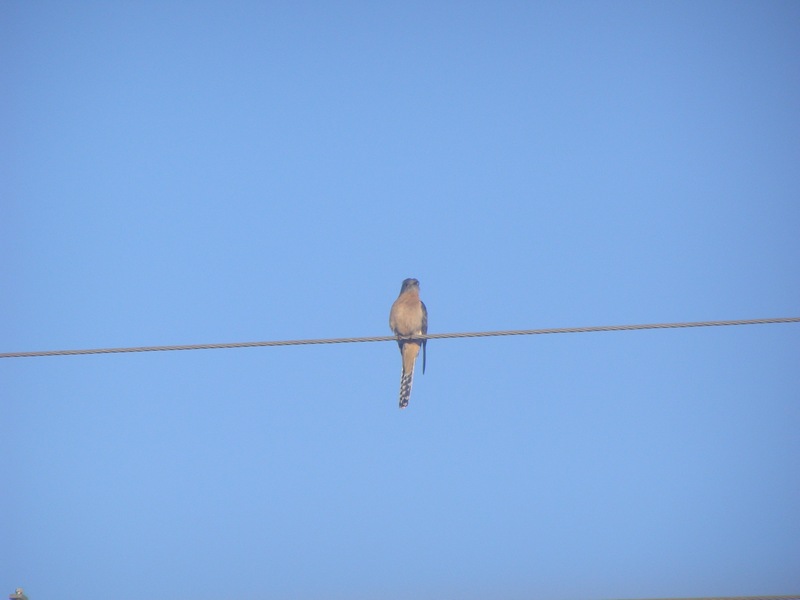 This morning God thrilled me or ‘trilled’ me ha ha – with a fan-tailed cuckoo – I was able to photograph him & capture his ‘trill’ sound on my phone! 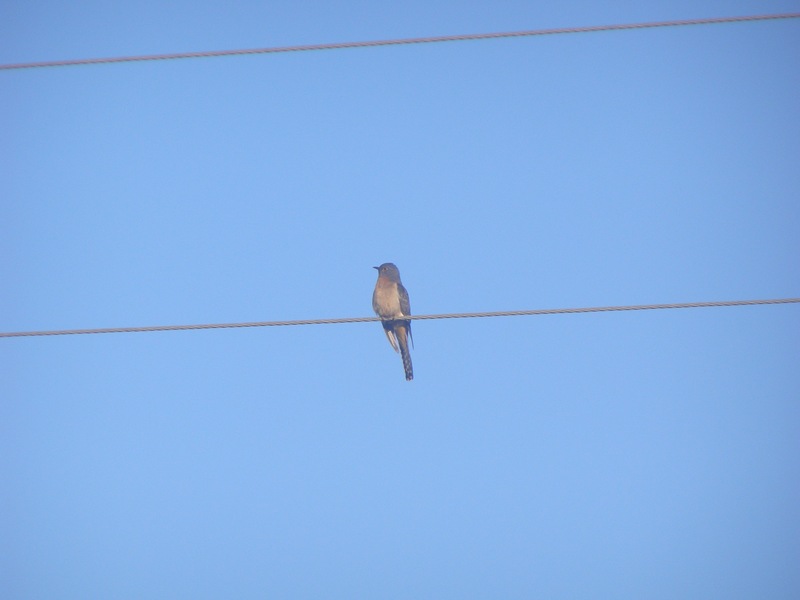 And have a look at what it says in my bird book about this cuckoo’s voice?! COME-ON! you have to agree God is good! No body can tell me that God doesn’t give you the desires of our heart – anyone who says that cannot appreciate or understand how really really awesome God is – for sure to be sure! 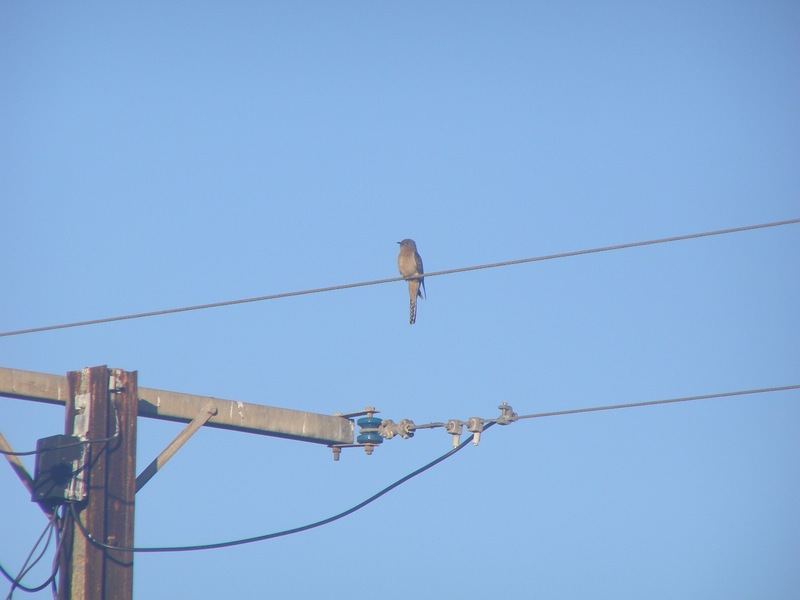 hear His still small VOICE – so thrilling – so trilling! resonates through your very core! 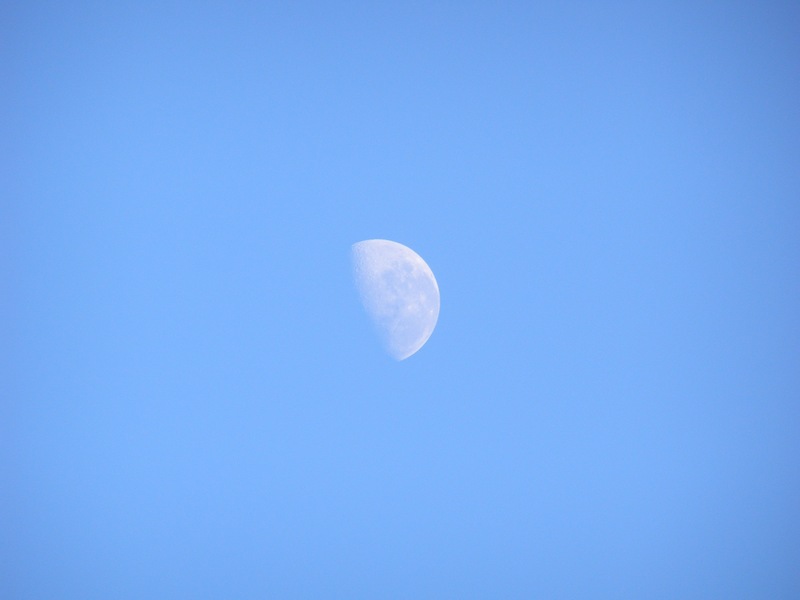 … & the moon at the same time – also thrilling! 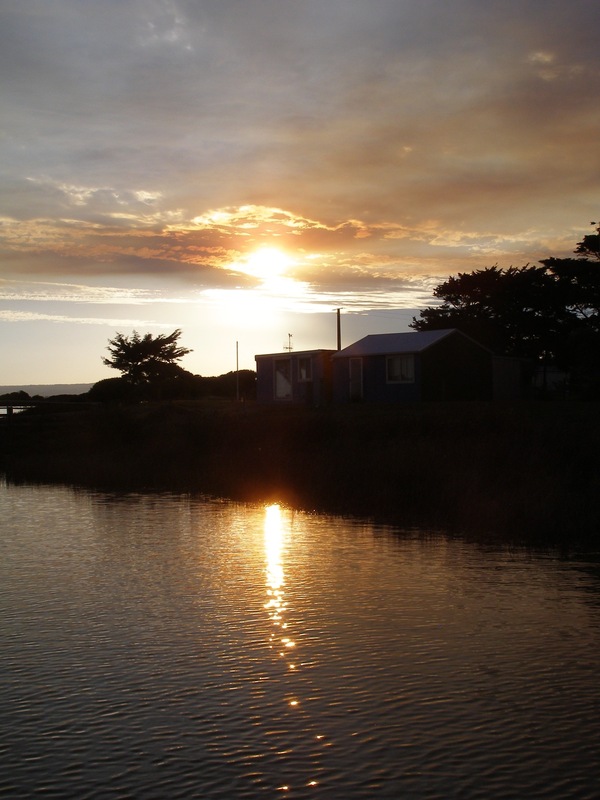 14th June – Today driving home – half way along Semashco Rd – thinking about the Glory Box again & Tabernacle – yes I was thinking – He is going to show me more bout His Marriage – sudden -FLASH in my eyes! extreme white light flash – an outline of a city in the blue sky & white clouds – it was like my mind snapped a photo – how instant it was – I have never had this kind of flash vision whilst being awake before – God is doing something new – He is doing something big! He has had enough of the immorality in the world – even into His Bride – I can’t wait to see Jesus come back in His people – but for real! 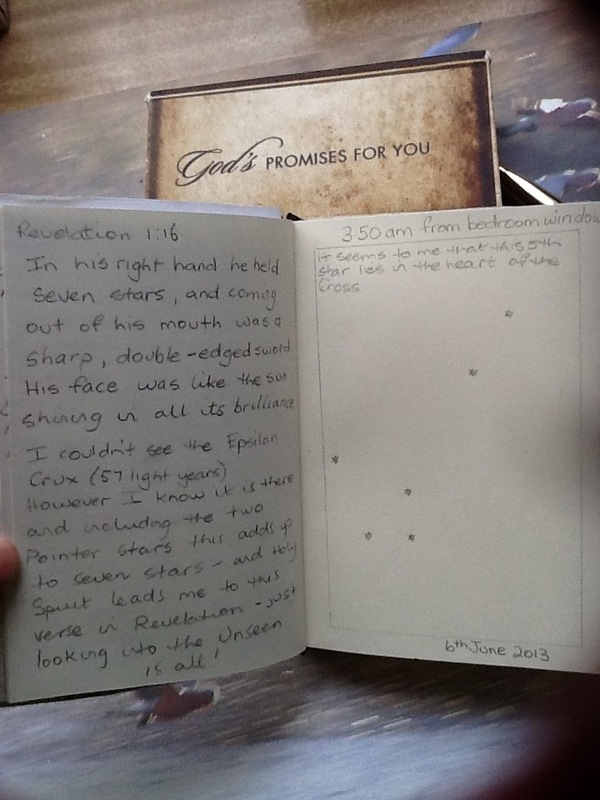 in Spirit & in Truth – with His power! Supernatural signs & wonders are coming to the Earth! look out because FLASH! just like that! 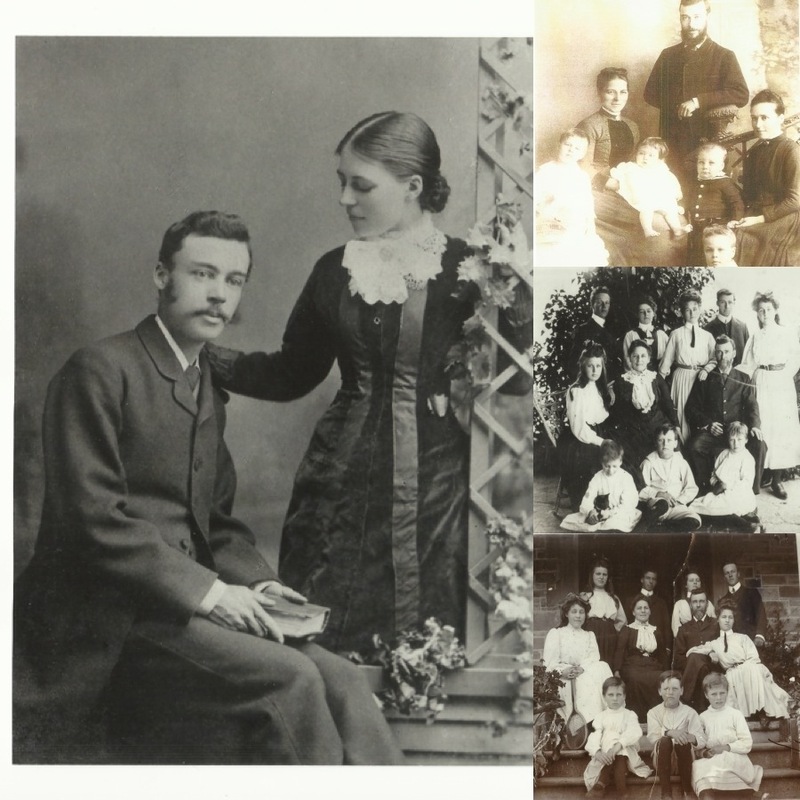 God has put it on my heart to consider the old fashioned glory box … & look again at this photograph of my great grandparents Ellen & Henry Meyer – the black wedding dress – solemn wear – to me represents the serious vow to love another forever – lest we forget the Truth of God for marriage between a man & a woman – only pray oh my soul & prophesy to the Breathe of God Holy Spirit hover over the people of this world – pursue hearts Lord – to see to convict to restore to entice the Sanctity of the union between a man & a woman – go into the world – to reveal the wonderful Mystery of Marriage & how it is created to be – meant to be – pure & honouring to God Himself – in the name of Jesus I ask I pray I prophesy I say yes You are Yeshua God of my Salvation! He had seven stars in His right hand; a sharp double- edged sword came from His mouth, and His face was shining like the sun at midday. The north and south celestial poles are the two imaginary points in the sky where the Earth’s axis of rotation, indefinitely extended, intersects the imaginary rotating sphere of stars called the celestial sphere. The north and south celestial poles appear permanently directly overhead to an observer at the Earth’s North Pole and South Pole respectively. As the Earth spins on its axis, the two celestial poles remain fixed in the sky, and all other points appear to rotate around them, completing one circuit per day (strictly per sidereal day). Crux, also known as the Southern Cross Constellation, is the smallest of the 88 constellations. Visible primarily in the southern hemisphere and low northern latitudes. Crux is circumpolar below -34 degrees declination(about 34 degrees South latitude). With five bright main stars, alpha, beta, gamma, delta and epsilon crucis, Crux is highly visible. All five of those stars are magnitude 3.6 or brighter and within 365 light years of Earth. From the top of the cross Gacrux(gamma crucis) trace a line south to Acrux (alpha crucis) and continue about 4.5 times that distance and you will get near the celestial south pole. Sigma Octantis is the southern pole star but is not very bright, so Crux offers a better guidepost. 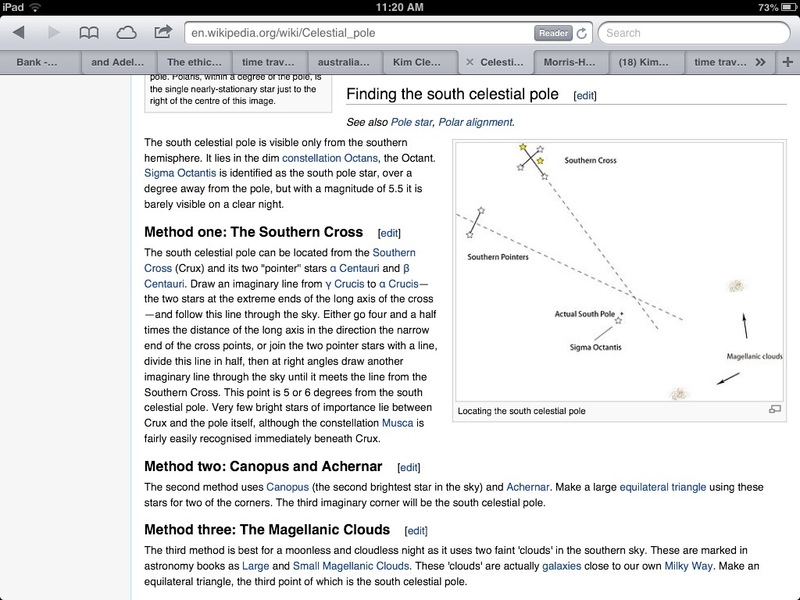 The nearby “false cross” an asterism often mistaken for the Southern Cross does not point to the south pole. Crux has the pointer stars Alpha and Beta Centauri leading to it. 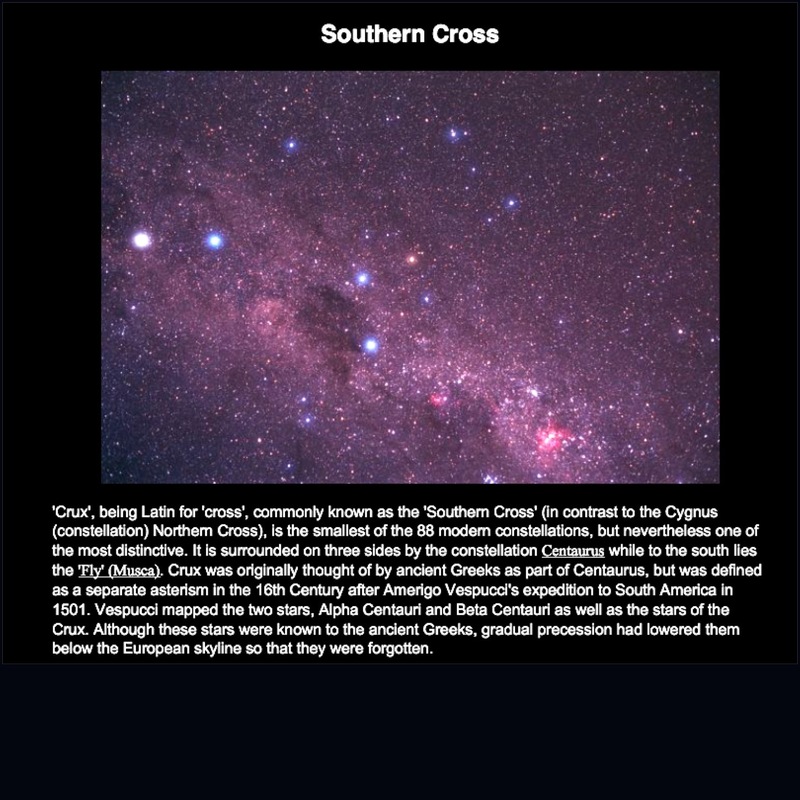 the true Southern Cross – it’s the smallest Constellation but it shines so bright & you can work out the position of the Celestial South Pole from it – what is Celestial ? – its of the Heavens I think – & look how they describe the Celestial South & North Poles – as the two IMAGINARY points in the sky where the Earth’s axis of rotation, INDEFINITELY extended, intersects with the IMAGINARY rotating sphere of stars called the Celestial Sphere – does not that description to you depict faith?faith in the Unseen to have discovered this precious reality of the Heavens – the INDEFINITE Heavens – God has put His sign in the Heavens – His Cross – to point all people on earth to Himself Who created all the Heavens – Jesus – Who on that Cross died for all who call upon His name – & He redeems every one who does call on His name – to forgiveness of sins & true Life while on Earth & Eternal Life – forever – indefinitely – no end – your Celestial Home? Just as by looking at the Southern Cross Constellation you can discover the position of the Celestial South Pole – so also by looking towards the Cross of Jesus Christ you can discover your Celestial Home with your Father in Heaven. For false messiahs and false prophets will rise up and will perform signs and wonders to lead astray, if possible, the elect. And you must watch! I have told you everything in advance. A person must look to the true Jesus in the Bible the Son of God Who came to Earth & then they will see into celestial realms of glory that our Father has purposed for them. This is how you know the Spirit of God: Every spirit who confesses that Jesus Christ has come in the flesh is from God. His love is far greater than this world’s false love – love of self & things – God is greater & He is pouring out His Spirit & signs & wonders will follow those that seek Him & seek to praise & worship Him with their lives & want His name to be glorified on Earth as it is in Heaven – so as for Heaven people do you believe? you should – because it’s true – expand your imagination & trust God just like those old time explorers must have done who first discovered this reality of the existence of Celestial places! So look to the stars! They are so beautiful & they light our Way in the darkness – observe & study the stars to see what God is saying to you Today! But first call upon His name Jesus – Yeshua -because He is the God Who saves you! 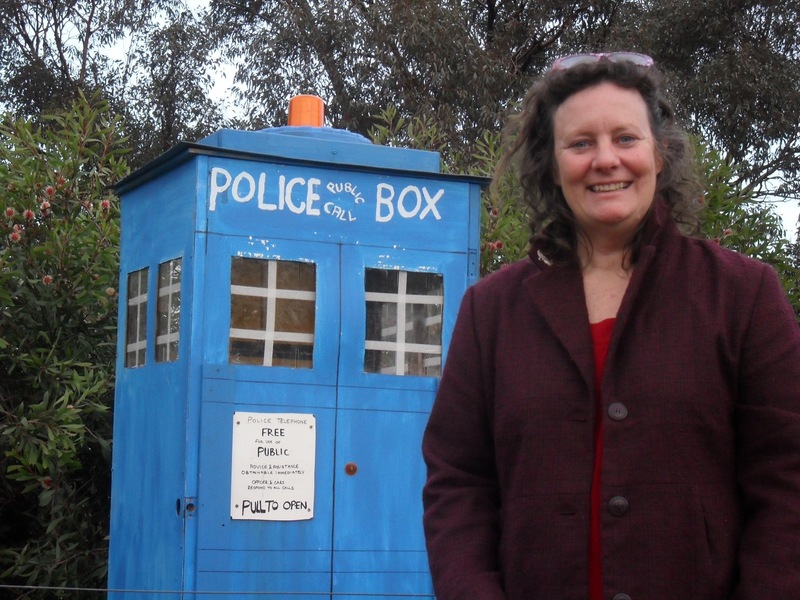 can you imagine with me getting into a time machine & setting it back to Jesus day – whoooooo – there we are back in Jesus day – where would you like to meet Him if you could choose? I’m thinking Mary’s house (Mary sister of Lazarus) – I’d like to be one of those women that cared for Jesus – even if we are afraid to go to Jesus let’s go anyway – let’s be brave – go with me in your imagination – imagine being there – we are invited to Mary’s house to stay a while because Jesus has come to tell & teach about His Father’s love – how would we be & what might we say if anything to Jesus or maybe we would be quiet – sit at His feet perhaps & relax into listening – & ponder His every Word – be like Mary perhaps? would we wait upon Him – with food & drinks – would we help Mary? would you come in the time machine with me? knowing that Jesus time was the first stop? I asked Tony to consider my question & he said that he would go to where Jesus turned water into wine – straight away the Wedding feast came to my mind & we discussed that this miracle probably was not Jesus first miracle but that this miracle was His first recorded miracle – how cool is Jesus – my God is an excellent God! Tony said that Jesus mother knew already her Son’s capabilities & that this probably wasn’t the first time that He had done something like turning the water into wine – Way to expand the imagination heh! God is better! God can put stars anywhere He likes – see the stars on the water in my last pic – to the shape of the Southern Cross & the Two Pointers! Only God can do that for me! 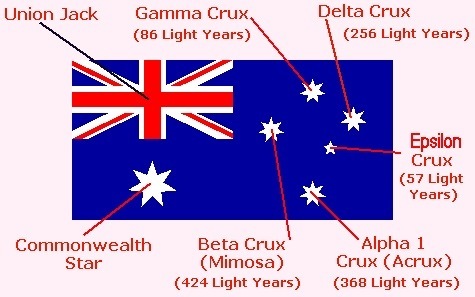 The Southern Cross contains four bright stars so situated that they depict the extremities of a Latin cross. Thousands of years ago these four stars were an object of reverence in the Near East. In the Biblical days they were just visible at the horizon. It was LAST SEEN from the LATITUDE of JERUSALEM at the time of the CRUCIFIXION of CHRIST. It is no longer visible at latitudes north of 25 degrees. In astronomy, axial PRECESSION is a gravity-induced, slow, and continuous change in the orientation of an astronomical body’s rotational axis. In particular, it refers to the gradual shift in the orientation of Earth’s axis of rotation, which, similar to a wobbling top, traces out a pair of cones joined at their apices in a cycle of approximately 26,000 years  (called a Great or Platonic Year in astrology). The term “PRECESSION” typically refers only to this largest secular motion; other changes in the alignment of Earth’s axis – nutation and polar motion – are much smaller in magnitude. Crux was visible to the Ancient Greeks; Ptolemy regarded it as part of the constellation Centaurus. It was entirely visible as far north as Britain in the fourth millennium BC. However, the PRECESSION of the equinoxes gradually lowered its stars below the European horizon, and they were eventually forgotten by the inhabitants of northern latitudes. By AD 400, most of the constellation never rose above the horizon for Athenians. The 15th century Venetian navigator Alvise Cadamosto made note of what was probably the Southern Cross on exiting the Gambia River in 1455, calling it the carro dell’ostro (“southern chariot”). 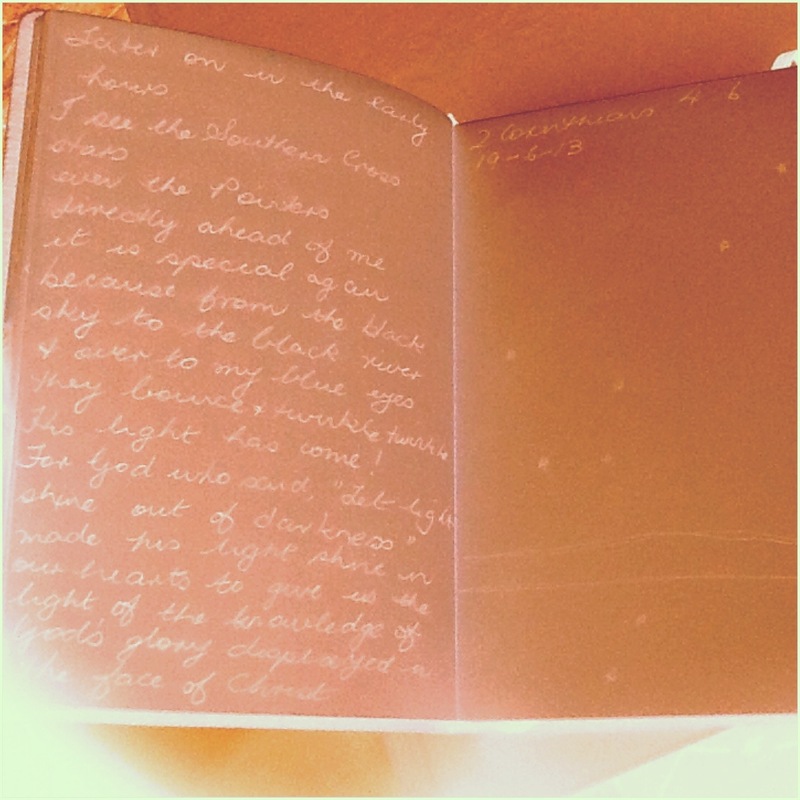 However, Cadamosto’s constellation had too many stars and was tilted incorrectly. Historians generally credit João Faras – astronomer and physician of King Manuel I of Portugal who accompanied Pedro Álvares Cabral in the discovery of Brazil in 1500 – for being the first European to depict it correctly. Faras sketched and described the constellation (calling it “Las Guardas”) in a letter written on the beaches of Brazil on May 1, 1500, to the Portuguese monarch. Émerie Mollineux has also been cited as the first uranographer to distinguish Crux; his illustration dates to 1592. Later adopters of the constellation included Jakob Bartsch in 1624 and Augustin Royer in 1679. Royer is also sometimes cited as initially distinguishing Crux. Explorer Amerigo Vespucci depicted Crux as an almond, called “Mandorla”. 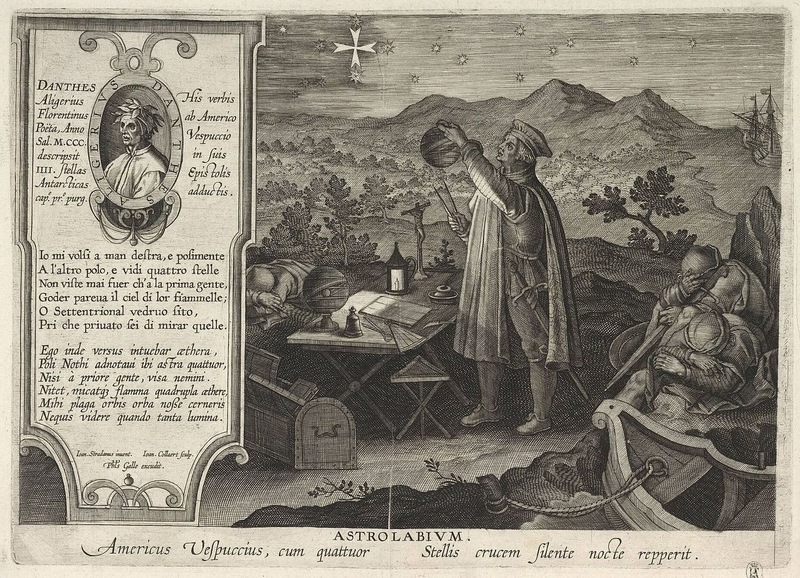 The separation of Crux from Centaurus is generally attributed to the French astronomer Augustin Royer in 1679, but other historians attribute the invention of Crux to Petrus Plancius in 1613. However, Crux was later published by Jakob Bartsch in 1624. Since the southern sky lacks an easily visible pole star, Alpha and Gamma (known as Acrux and Gacrux respectively) are commonly used to mark south. Tracing a line from Gacrux to Acrux leads to a point close to the Southern Celestial Pole. Alternatively, if a line is constructed perpendicularly between Alpha Centauri and Beta Centauri, the point where the above mentioned line and this line intersect marks the Southern Celestial Pole. The two stars of Alpha and Beta Centauri are often referred to as the “Southern Pointers” or just “The Pointers”, allowing people to easily find the asterism of the Southern Cross or the constellation of Crux. Tony & I are like the two pointer stars pointing to the Cross of Jesus with our faith & with our lives – we love Jesus – He is Yeshua God of our salvation – & when He gave up His last breathe on that Cross He gave us eternal life- it’s because of Him that we live forever – we will always shine for Him – He is the Light of the world – He came for all the world & if only all the world would call upon His name & then all the world could be saved to eternity. From noon until three in the afternoon darkness came over the whole land. About three in the afternoon Jesus cried out with a loud voice, Elí, Elí, lemá sabachtháni? that is, My God, My God, why have You forsaken Me? When some of those standing there heard this, they said, Hes calling for Elijah! Immediately one of them ran and got a sponge, filled it with sour wine, fixed it on a reed, and offered Him a drink. But the rest said, Lets see if Elijah comes to save Him! Jesus shouted again with a loud voice and gave up His spirit. Suddenly, the curtain of the sanctuary was split in two from top to bottom; the EARTH QUAKED and the rocks were split. The tombs were also opened and many bodies of the saints who had fallen asleep were raised. And they came out of the tombs after His resurrection, entered the holy city, and appeared to many. When the centurion and those with him, who were guarding Jesus, saw the EARTHQUAKE and the things that had happened, they were terrified and said, THIS MAN REALLY WAS GOD’s SON!